K Vaitheeswaran is currently the chief operating officer of Indiaplaza, the world’s largest India-centric e-commerce company with operations in Bangalore, Chennai and Austin, Texas. K Vaitheeswaran is a co-founder of www.fabmall.com, the company that pioneered the Indian E-commerce Industry. Since September 1999, he spent all his time and efforts in not only building Fabmall.com into a position of industry leadership but has also been engaged in evangelizing the cause of E-commerce in India. 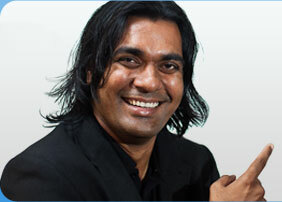 In November 2006, The Pitch magazine listed him among the Top 20 people in the Indian Internet industry. He also co-founded the Fabmall chain of grocery stores, which has become one of the leading brands in the Indian organized retail industry. Sameer Sisodia is a cofounder of Ziva Software, the makers of Zook, a mobile search service. Its an interesting company that is incubated at the prestigious Indian Institute of Management, Bangalore. their friends. Ability to find both on-web and off-web content in an intuitive and interactive manner provides a rich and satisfying experience to end-users. Ziva’s platform powers some of the biggest local directory search names in India – JustDial, InfoMedia being are some of the customers. Ziva also partners with some of the leading mobile content companies, and other service providers. Ziva is a VC-backed, professionally-managed, product development company with exclusive focus on mobile-based access, search, and navigation. Ziva Software operates out of the NSR-GIV Center within the prestigious Indian Institute of Management (IIM) at Bangalore. GB Prabhat talks about what made him leave his top position as a Director at Satyam, one of India’s biggest software companies, and take the hard route to entrepreneurship. This particular edition will be of special interest to both entrepreneurs and to those who aspire to be one. When he quit Satyam recently, he had helped grow its Enterprise department’s revenues to 200 million US dollars a year. His new venture, Anantara Solutions, has gotten seed funding of $6.5 million US dollars from Helion Venture Partners, Walden International and Silicon Valley Bank. He talks about his experience in getting funding and also shares his advice to those wanting to jump into the entrepreneurship bandwagon. Anantara focuses on Second Generation Outsourcing (SGO), a business paradigm that radically improves first generation outsourcing which is predicated primarily on cost arbitrage. GB Prabhat helped net in $200 million in revenue when he decided to quit Satyam Computer Services, one of India’s largest software companies. Prabhat left his cushy job to found a startup called Anantara Solutions which received investments of $6.5 million from Helion Venture Partners, Walden International Silicon Valley Bank. Prabhat says “By pioneering SGO, we at Anantara Solutions are reinventing the offshore delivery model combining the efficiencies of a top-notch consulting firm and a high quality offshore delivery firm. In 1995, he co-founded Satyam Renaissance Consulting, a then subsidiary of Satyam Computer Services. Prabhat believed strongly that, much as IT services work was beginning to be offshored, all manner of consulting services could be delivered using the onsite-offshore model with India as the hub of such services. Prabhat is also a writer of fiction. His first novel, Chains, was published in November 2000 to critical acclaim and his second novel, Eimona, was published in 2006.